Earlier this week ASChin did an excellent job of explaining how Gerald Henderson will likely be the odd man out in the rotation and could be on the move in a trade sooner rather than later, even offering up some potential trade destinations (Find that here). I had no idea he was working on that post and, independently, had been thinking about Henderson and if/how he fits on the team this coming season. I wanted to take a statistical approach to determining his value either on the team or as a trade target. The case for keeping Henderson relies on the hope that he’ll recover after a down year while handling a reduced role after having been a team captain and one of the franchise cornerstones during a painful rebuild, ceding a starting position and minutes to the newly arrived Lance Stephenson. That’s a reasonable expectation, right? Let’s pretend it is. And let’s pretend last year was more adjustment period than future projection. Given those extremely reasonable parameters it would be hard to let him go right now when Charlotte couldn’t even get a late 1st from a contending team for him, after which said contender (Clippers) drafted essentially the same player in CJ Wilcox that they did last year with Reggie Bullock. 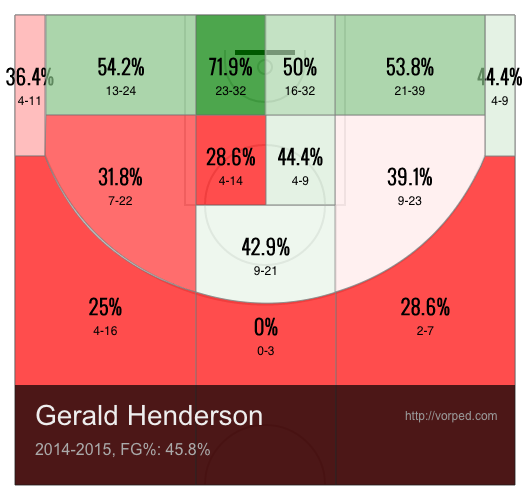 2012-13 Gerald Henderson was a solid role player. He posted the 10th best PER among shooting guards at 16.48. 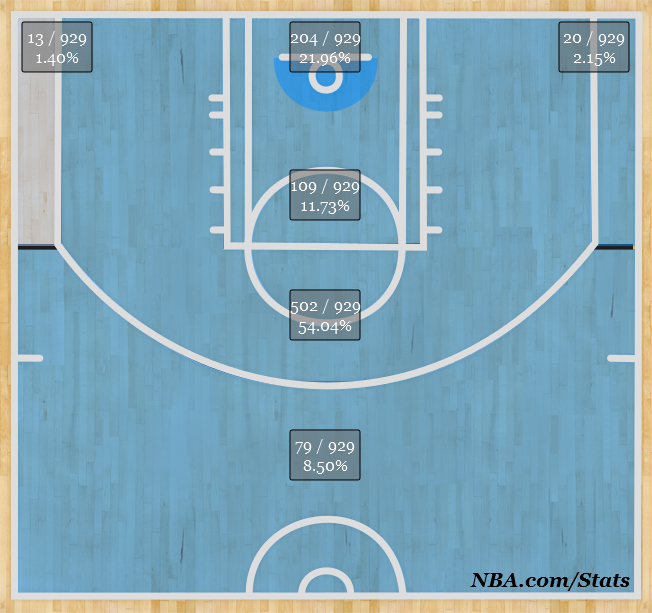 That’s better than Monta Ellis (16.3), Kevin Martin (16.09), Eric Gordon (15.43 and a max freaking contract), JJ Redick (14.74), Ray Allen (14.72)… Hendo can be an extremely frustrating player to watch, but don’t let all those mid-range jumpers fool you. He was extremely productive in 2012-13. He wasn’t particularly great at anything, but he was good at enough things. So what would bench mob Henderson look like? Since I don’t have my own database set up to do a sufficiently deep search (I’m working on it), I had to use the tools at stats.nba.com. Searching for players that played more than 25 minutes with an offensive rating between 98 and 102 and a true shooting % between 47% and 53%1 and perusing several years’ worth of results, 2 names stood out as being similar while also having transition from a starting role to a bench role at some point. Evan Turner hasn’t spent enough time coming off the bench as a veteran, so he was out, so I settled on Rodney Stuckey, which, after thinking about it, made a lot of sense. They have similar size, similarly limited range, and average play-making abilities. Stuckey is the better passer while Henderson is a better defensive player and rebounder. You can see how similar they are in the following chart, created using career data from basketball-reference.com. Stuckey was a (mostly) full-time starter in 2011-12, when he started 54 games and came off the bench in 16. Over the next 2 seasons, he came off the bench in 120 out of 149 games played. As if the career numbers weren’t enough, the career arcs are eerily similar. Both players steadily improved each year before having career peaks in their 4th year, followed by a regression year, then a demotion to the bench as their respective teams went in different directions. This makes Stuckey a decent place to turn to when trying to gauge the effect of a bench move. It should be understood that this isn’t necessarily what can be expected from Henderson, it’s just an example of a similar player making a similar move at a similar point in his career. Let’s go straight to the numbers for this. Stuckey peaked as a starter in 2010-11, showing real progress and the potential to be a solid long-term contributor for the Pistons both as a scorer (but not necessarily a shooter) and a play-maker. The following season, again mostly as a starter, saw him regress some. In 2012-13, Stuckey spent most of his time coming off the bench and his game suffered. Every shooting metric, drawing fouls, assists, as well as the overall offensive rating and PER metrics all dropped significantly. The team around him changed very little. Lawrence Frank was coach through both seasons. 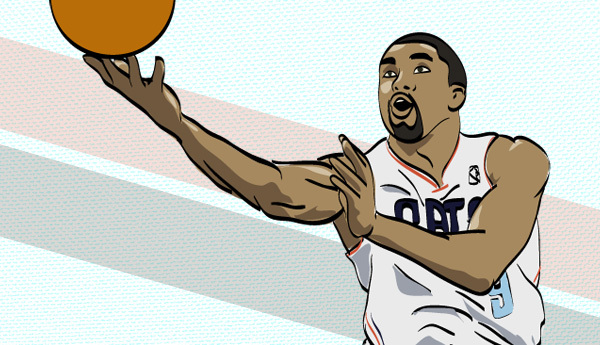 Ben Gordon was traded for Corey Maggette (in Cho we trust) while Andre Drummond and Kyle Singler were brought in. Given that level of continuity, it appears something else was going on. Given the decrease in usage rate coupled with a significant decrease in earned free-throws, I’m going to roll with Occam’s razor and suggest Stuckey struggled adjusting to a role off the bench. Anyone who has played pick-up basketball knows what it’s like to play a game where you only take 1 or 2 shots, sit out a couple games because the court is way too crowded, then come in and try to get back in the flow of the game. Some players seem to be born for it. Most struggle to find a rhythm playing so inconsistently. Another factor that causes me to think he struggled with his new role is his improved play the following season under similar circumstances. 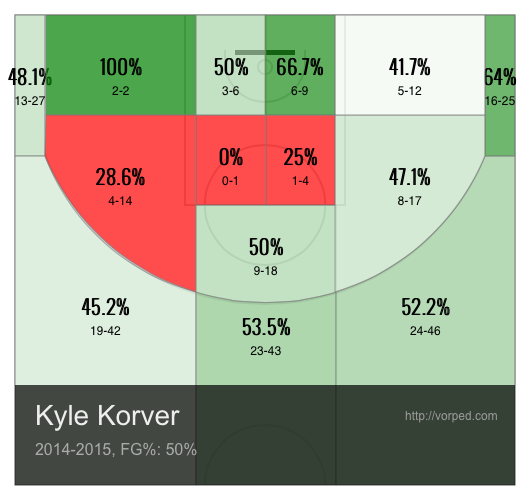 While he didn’t recover to the success he saw as a starter, he did see his usage rate and shooting numbers improve. This suggests to me that, as he grew more comfortable coming off the bench, his efficiency improved. I expect Henderson to experience a similar dip if/when he starts coming off the bench. 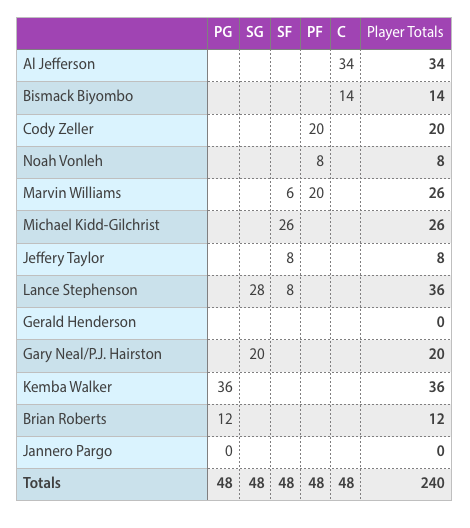 My biggest concern for him as an effective bench player is his how he scores, as seen in the chart below. 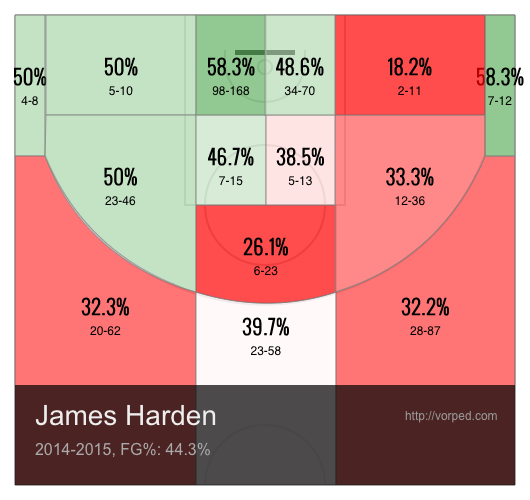 With 54% of his shots coming from the mid-range, my concern is that his efficiency too dependent on rhythm. This concept is rooted in more than just conjecture and personal experience. As his opportunities increased each season, seeing bumps in both shots per 36 minutes and usage rate in every successive season, his shooting numbers improved. 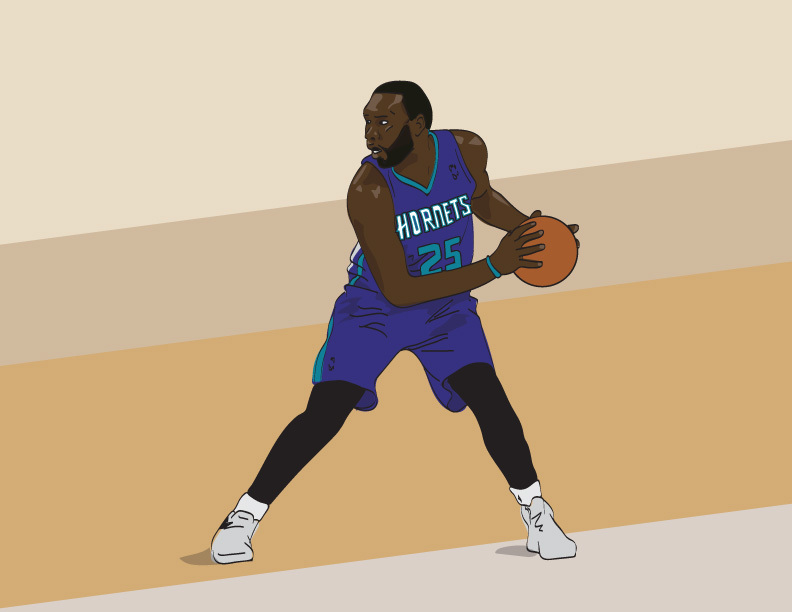 When Charlotte added Al Jefferson, a high usage player and the new focal point on offense, Henderson’s field goal attempts per 36 minutes dropped by almost 1 attempt while his overall usage slipped from 23.5% to 22.1%. Being the pessimistic person I am, I expect Henderson to struggle much like Stuckey. He doesn’t have the type of game that would benefit from playing against 2nd units, as he doesn’t attack the rim or post-up. He limits himself to scoring off cuts and pull-up mid-range shots, the types of things he already gets at will (mostly because the defense wants him taking those shots). I do think he can be an effective bench player in time, and that his numbers will improve as he adjusts, much like Stuckey’s did, but I’m skeptical he’ll ever match his production from the 2012-13 season. The best path to improvement for Henderson is developing a 3-point shot. Shooting is something that can be, and often is, improved over time. I would be more optimistic about that type of improvement if Henderson had more confidence. LeBron is an obvious example of a player going from a below average 3-point shooter to a very effective shooter from deep. I’m relatively cool on Henderson experiencing that type of improvement. The difference between the 2 players when it comes to improving shooting is confidence. Nobody has identified a metric using SportVU data that measures confidence, but I think that lack of confidence bears itself out in quantifiable performance. Even when he was shooting under 35%, LeBron was still jacking up between 3.5 and 4.7 3’s per 36 minutes. Henderson has never attempted even 2 per 36. Ignoring mechanical issues in his shot (which there are plenty), his unwillingness to even attempt available shots isn’t going to help him become a better game shooter. Watching video2, he doesn’t come off cuts or screens ready to shoot, often choosing to take one dribble in and pull up. I think it’s more likely that a move to the bench hurts any progress he has or might make more than it helps. With multiple options waiting in the wings (pun intended) in Gary Neal, Jeff Taylor, and PJ Hairston, coupled with a likely dip in production from Henderson, I have to agree with our fearless leader that Henderson has to go. 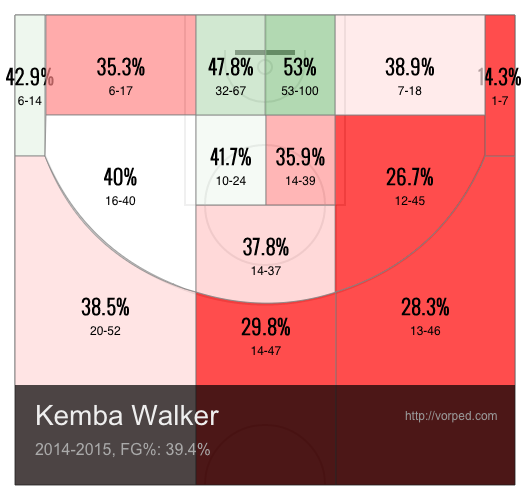 His stock isn’t going to improve playing less minutes with decreasing levels of production. It would have been best to move him following the 2012-13 season. Plenty of reports have suggested Cho has been gauging the league’s interest the last couple years and nothing has materialized. I expect the market will be fairly dry. I’m not much for guessing at trade options, but I think it’s worth assessing his value as a trade target. I believe I’ve sufficiently covered Henderson’s offensive value. Anyone looking to add him will do so in hopes of improving their wing defense. 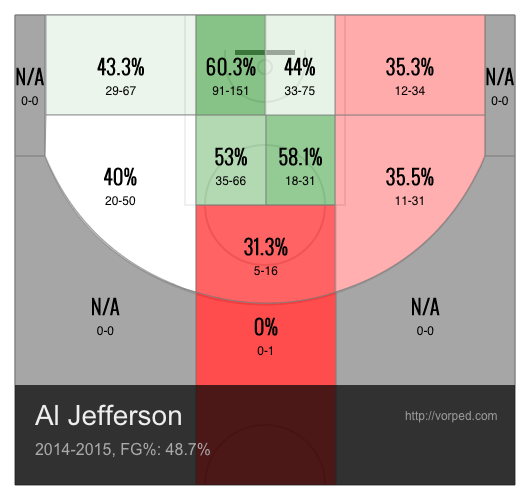 The problem is that Henderson’s defense appears to be much like Jeff Taylor’s shooting, little more than reputation. With the caveat that defense is much harder to quantify for an individual than offense, there is little evidence that Henderson is a plus on that end of the floor. Over his entire career, Charlotte has been 1.4 points per 100 possessions worse on defense with Henderson on the floor, per basketball-referene.com. Turning to ESPN’s Real Plus-Minus, he posted a -.95 defensive RPM, 41st among shooting guards3. His block and steal counts are perfectly average for a shooting guard. If Cho is looking to move Henderson, and I think he should, I don’t think he should expect much in return. Finding an interested team will have less to do with his value in a vacuum and more to do with his value to said team. You can probably cross off rebuilding teams. Henderson appears to be what he is at this point. That leaves contenders looking to shore up their wing defense (Henderson is probably a better defender than the numbers show). Given those parameters, I would be looking to pick up some potential asset in return. 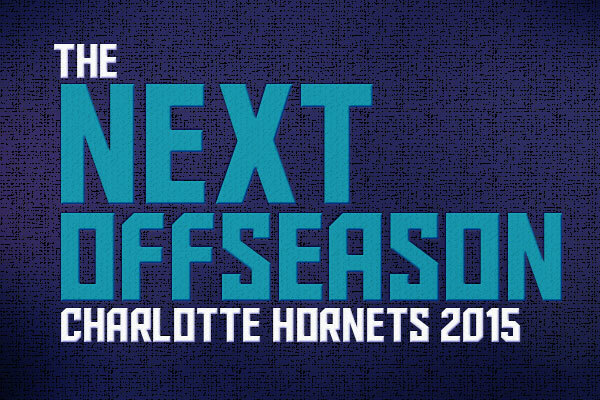 A late-round pick, an underused young player, the rights to a euro-stash… I like Charlotte’s roster as constituted right now. There is a solid PG rotation, depth and versatility on the wings with guys that can play multiple positions, and enough bigs to do the job. There really aren’t any immediate needs that I see. I like ASChin’s proposal with Cleveland in principle. While I don’t like helping out a team in the east, they have a clear need for a defense oriented wing. I would look to involve a 3rd team before trading Biz for Varejao just because of durability concerns while picking up an asset. Henderson has been a solid Bobcat during his career. 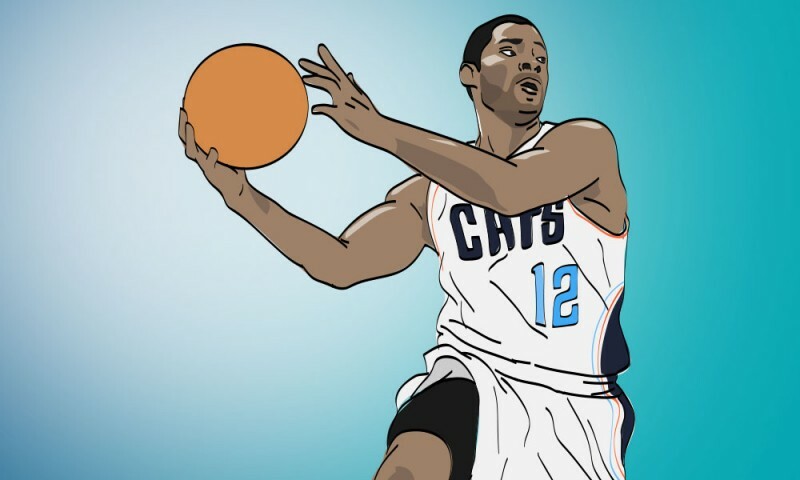 He’s bridged the gap between 2 different eras of Charlotte basketball and deserves credit for sticking it out. But it’s time for the franchise and player to move on from one another. A trade at this point would be mutually beneficial and the sooner, the better, so as to avoid any potential conflicts over roles and/or playing time. As I see it, trading Henderson is an opportunity to continue to build for the future without sacrificing anything this coming season. 1. I chose effective FG% because it takes into account added value from 3 point shots, and NBA.com only lets you add 5 custom filters, so it represented a reasonable composite number to use. Limited filters was the motivation for using offensive rating as well, also a nice composite type of number to use. 2. Per multiple requests, I tried to embed gifs or create videos as examples. For a software developer, it’s pretty sad how incompetent I am when it comes to anything other than programming and system maintenance. Tutorials are welcome. 3. Wesley Matthews was 44th with a -1.08. There’s still a lot to learn about RPM.